My garden is a bit neglected at present. I did try to keep an eye on it during the past two months, but it was a bit difficult to keep up with when I wasn't living there too and the weeds have gotten completely out of hand. Luckily I have a lot of perennials and seasonal stars planted, and they keep going according to their own calendars. Late autumn brings a lot of golden leaves and berries, seed heads and browning petals. There is also the first batch of the winter bloomers, and even a couple of rather confused spring bulbs who have decided to put in an appearance. So, even though it's a bit of a tangled mess outside, there is still enough beauty to lift my spirits when I glance out the window. I can't wait to finish my sanding and painting so I can get out there and tidy things up a bit... maybe it's not so bad that we're coming into winter, at least things will slow down! 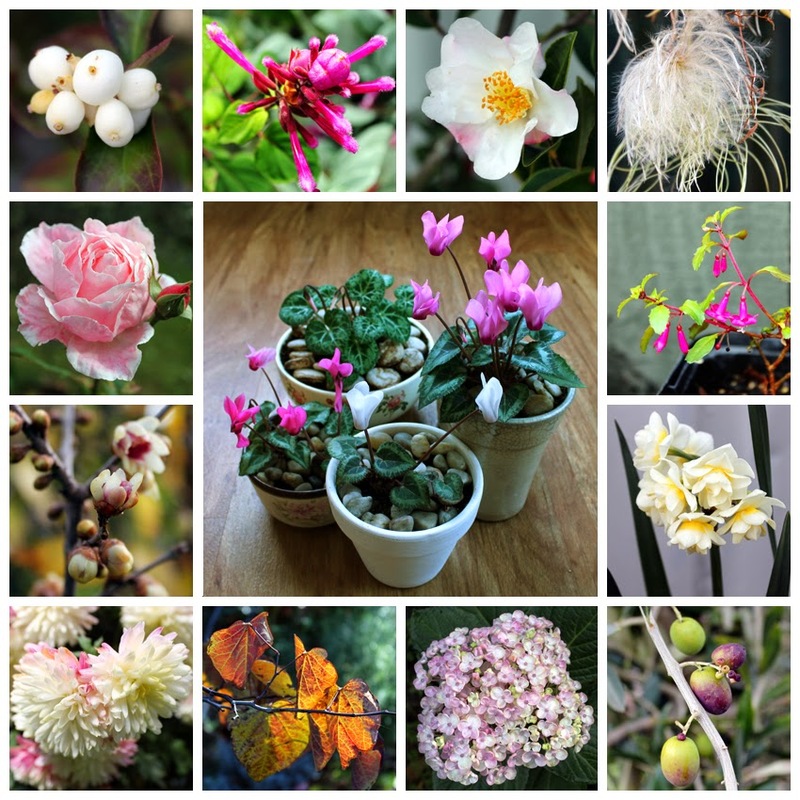 Here are this month's flowers, clockwise from top left: snowberries; salvia; the first of the Fairy Blush camellia (one of my winter stars, you will be seeing more of this! ); the yellow clematis seed head (I'm enjoying how this changes, it's less silky and more fuzzy this month); fuchsia Lottie Hobby; an early earlicheer; olives colouring up; a late hydrangea; bright leaves on the Cercis; the chrysanthemum which have changed colour from orange to white; wintersweet (another winter star - I literally wait all year for this to bloom, I love it! ); a late bloom on the Queen Elizabeth rose. Middle: my indoor cyclamen are in bloom. Time to distribute them around all the rooms in the house. Love your snowberries, it reminds me October here.And the rose Queen Elizabeth reminds me July here. Ha ha, Ruth! Our temps are different now: heat and cool nights. Your cyclamens are wonderful, I never could grow them well.